Lufthansa is flying nonstop once again from Munich to Teheran. Starting on July 4, 2016, 2016, the connection under flight number LH 602 began three times a week at 22.10 pm, arriving at the Iranian capital at 5.20 am. The Airbus A330-300 offers Lufthansa passengers the latest cabin facilities including Premium Economy with 21 seats. With this new connection the Lufthansa Group is expanding its daily offer with a Boeing 747-400 from Frankfurt. Moreover, Austrian Airlines is flying up to twice a day from Vienna with an Airbus A320. Copyright Photo: Lufthansa Airbus A330-343 D-AIKE (msn 636) DUS (Michael Stappen). Image: 911459. This entry was posted in Lufthansa and tagged Airbus A330-343, D-AIKE, DUS, Lufthansa, msn 636 on July 5, 2016 by Bruce Drum. 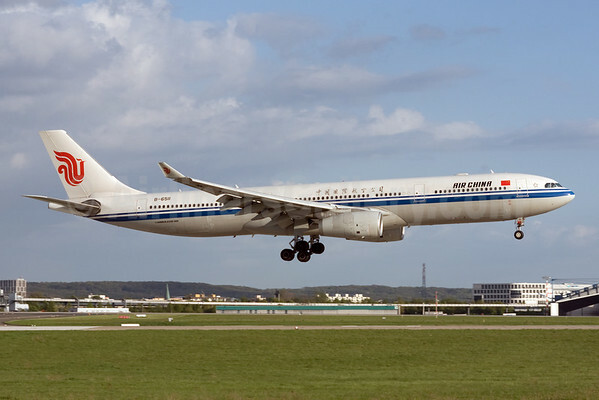 Air China (Beijing) will start Beijing-Vienna-Barcelona service on May 5, 2014, giving travelers an additional easy access to the “Capital of Music” and the “Flower of Europe”. The four-times weekly service CA 841/2 will be offered on Mondays/Thursdays/Fridays/Sundays. The outbound flight will leave Beijing at 02:10 and arrive in Vienna at 06:10 local time and in Barcelona at 09:25 local time. The return flight will leave Barcelona at 11:25 local time and arrive in Vienna at 13:25 local time and Beijing at 05:55. 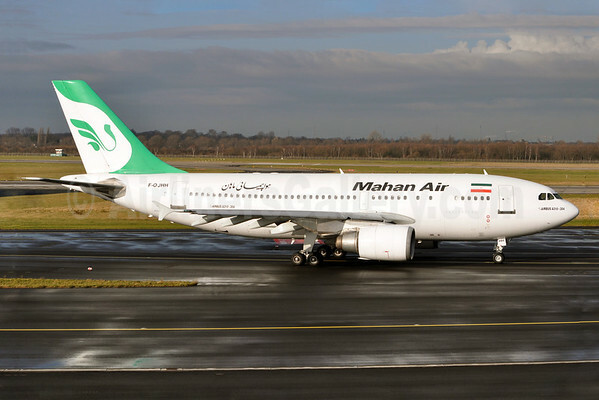 The service is to be operated with an Airbus A330-300. Onboard, the Business Class is outfitted with full-flat seats. The Premium Economy Class offers 120% of the legroom available in standard Economy Class and great mileage deals. The Economy Class impresses with its ergonomic seats that make journeys less tiring. Personal entertainment systems are available in all classes of service. For a long time, no nonstop flights have been offered to link East Asia and Barcelona, and there have been very few flights between Beijing and Vienna. As a member carrier of the Star Alliance, the world’s largest airline network, Air China has been actively expanding its European schedule. Currently, Air China offers more than 100 flights per week between China and Europe, serving such major European cities as London, Paris, Frankfurt, Rome, Moscow and Madrid. The Beijing-Vienna-Barcelona service will bring Air China’s European routes up to 23, offering access to 19 European cities and expanding the carrier’s European network. It will further improve its global network with its hub in Beijing and make it easier for travelers to transit to other parts of the world via Beijing. Copyright Photo: Michael Stappen/AirlinersGallery.com. Airbus A330-343X B-6511 (msn 1110) touches down in Dusseldorf. This entry was posted in Air China and tagged 1110, A330, A330-300, A330-343X, Air China, Airbus, Airbus A330, Airbus A330-300, B-6511, Beijing, DUS, Dusseldorf on February 28, 2014 by Bruce Drum. Flybe (Exeter) has unveiled a major expansion of its operations at Birmingham Airport with the announcement of seven new routes that includes a six times a week service to Florence, in a first for the airport; daily flights to Cologne; a six times a week service to Toulouse; a five times a week service to Alicante and four times a week to Bordeaux, Palma Mallorca and Porto. Flybe is also adding three of its 2×2 seat Embraer 175 jets to the airport thereby creating its biggest ever regional base with 12 aircraft, thereby creating more than 50 new Flybe jobs. Travel is effective from April 10, 2014 to Alicante, Cologne, Florence and Porto; and from May 13 for the remaining three routes (Bordeaux, Palma and Toulouse), the majority of flights will utilize Flybe’s new 88-seat E175 jet aircraft (see above). The company last week announced it will be boosting the frequency on three of its most popular European routes from the end of March namely those to Hanover, Milan-Malpensa and Stuttgart. 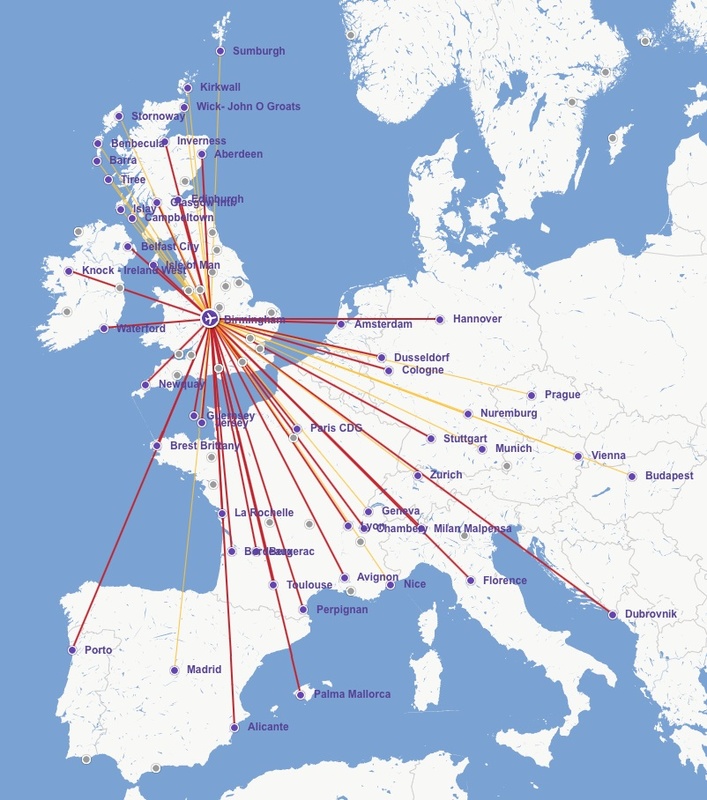 As a result of the seven new destinations, Flybe will now operate 32 routes to and from Birmingham for the Summer of 2014 with a choice of up to 375 return flights a week totalling an impressive 1.7 million seats. Copyright Photo: Ole Simon/AirlinersGallery.com. Embraer ERJ 170-200STD (ERJ 175) G-FBJA (msn 17000326) taxies at Dusseldorf. 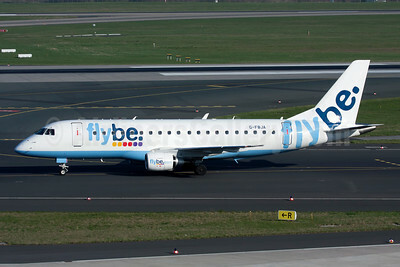 This entry was posted in Flybe and tagged 17000326, Birmingham, Birmingham Airport, DUS, Dusseldorf, Embraer, Embraer 170, Embraer 175, Embraer ERJ 170, Embraer ERJ 170-200, ERJ 170, ERJ 170-200, ERJ 170-200STD, ERJ 175, Flybe, G-FBJA on January 31, 2014 by Bruce Drum. Dr. Justin Gordon Abdy spends the time waiting. Standing at the window façade where the gate is located, he allows his gaze to wander across the airport’s airfield. Dawn is breaking. In his head, he runs through his documents one more time in preparation for the talk he has scheduled for today. Out of the corner of his eye, he notices a red and white aircraft behind the glass panel. It taxies slowly to the runway. D-ABDY – five letters on the tail of the aircraft suddenly grab his attention. Abdy is his surname! It can be traced back to the English knights and barons of the 17th and 18th centuries. He wonders how the name ended up on the tail of the aircraft and takes out his smartphone. He does some investigation into the matter. The aircraft with this registration code is an Airberlin Airbus A320. Every aircraft in the world is uniquely designated so that it can be precisely identified wherever it is. In Germany, the aircraft registration code is assigned via the higher federal authority for civil aviation, the LBA (German Federal Aviation Office) in Braunschweig. An international classification system is used for determining the registration code. The first letter represents the country of the operator – in this case “D” for “Deutschland” (Germany). The hyphen is followed by a letter that designates the maximum take-off weight (MTOW) of the aircraft. All those with the letter “A” after the country designation have a weight of over 20 tons. This Airbus is even authorised for a MTOW of 77 tons. Later, Dr Abdy sends a snapshot of the A320 to Airberlin. Germany’s second largest airline tells him more about the aircraft registration code. The sequence of the other letters in the registration code is determined by the airline operating the aircraft itself. It then needs to be approved with official authorizations in accordance with specific regulations. Moreover, the letter combinations selected by the airline must not be present on any other aircraft anywhere in the world. At Airberlin, everything regarding aircraft registration is handled by the CAMO (Continuing Airworthiness Management Organization) team, where Nicole Pietsch and her colleagues are based. This team is dedicated to maintaining the airworthiness of the Airberlin fleet and, among other things, deals with the complex authorizations required for the aircraft at the LBA. The process as a whole begins long before the aircraft is allowed to taxi for the first time on the airport apron. The Airberlin aircraft have an average age of just five years. The authorization process starts approximately half a year before an aircraft joins the Airberlin fleet. When this happens, Nicole first of all, files an application for the reservation of a registration code, which is used by the office responsible for handling the matter to open a file for this aircraft. For the registration code, Nicole determines the letters towards the end in accordance with a scheme. Because Airberlin is also otherwise abbreviated as “AB” on flight tickets, the third letter is often “B”. The other letters are then chosen to enable the Airberlin technicians to recognise the equipment of an aircraft, or its type, immediately from the combination of letters. For instance, all Airbus A320 aircraft which have the same equipment have “D”, “F” or “N” as the fourth letter. If it were a case of proceeding in a purely chronological and alphabetical order, the letter “E” would also be used, but this letter is already occupied by aircraft of other airlines. The last letter then follows in accordance with the order of the alphabet again. Since Nicole has been following this procedure for a while now, the classification system continues to be used for all newly authorised airberlin aircraft. In order to register an aircraft, however, yet more steps have to be taken – simply establishing a registration code is not enough. The initial application to the LBA is followed by many more at specific points in time – for initial registration, prior to delivery, following the technical checks and after certain approvals and inspections have taken place. Everything is put down in writing. For instance, even with four to six weeks to go before delivery takes place, the airberlin legal team makes an application for the purpose of registering the aircraft. When all the necessary steps have been taken, Nicole personally brings the documents to Braunschweig. The day on which the aircraft is to be authorised is an exciting one. Carrying a vast number of original documents under her arm, she goes to the LBA and only leaves the office once she has the newly issued authorisation documents such as the certificate of airworthiness, the registration certificate and the noise certificate. Then, at the end of the day, she also receives the Air Operator Certificate (AOC) via fax, which permits the aircraft to be flown as part of the airberlin fleet. Though he has learned that the Airbus is not directly named after his surname but simply happens to share the same sequence of letters, Dr Abdy is still delighted that an aircraft bears his surname. 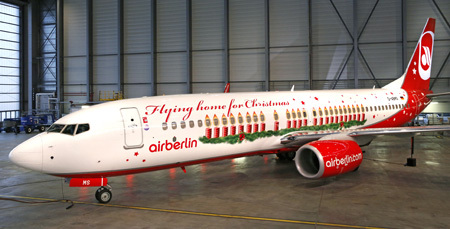 Airberlin is once again operating its aircraft decorated in Christmas livery under the motto “Flying home for Christmas”. The Boeing 737-800 will continue to be out and about on the airline’s European route network right into January. Anyone who flies home for the holiday season with Airberlin on a regular basis has a good chance of travelling in the festively-decorated aircraft. The inaugural flight for Airberlin’s Christmas aircraft will go from Dusseldorf to Copenhagen. “I am delighted to have the opportunity of operating the first flight this year in Airberlin’s Christmas colors. It’s always a special occasion, bringing flight guests home to their families and friends in airberlin’s Christmas aircraft,” First Officer Andreas Graute explained. This year the design of the Christmas plane resembles a string of fairy lights. There is a candle-like light for each day of Advent. “The windows of the aircraft constitute the flames of the candles. For the first time we have a Christmas design that achieves a completely different effect at night to that created during the daytime. The aircraft has an especially atmospheric ambience on evening flights,” said André Rahn, Senior Vice President Marketing. The design was created by RAPP Germany. The interior of the plane is also decorated in festive mood with specially-designed headrest covers. The Boeing with the registration D-ABMS, which is affectionately known as “Merry Santa”, arrived at Hangar 7 at Dusseldorf Airport on November 13. First of all, the fuselage of the aircraft was thoroughly cleaned. On November 14 the seven-man Airberlin technik team started work. The first step was to once again clean all the surfaces to be decorated with special detergent. Next the sheeting, which is certified for aviation and specially UV-resistant, was mounted on the fuselage of the aircraft. Finally, an edge sealer was applied to the leading edges in order to prevent the sheeting from peeling away and to guarantee optimal airflow. The sheeting with the fairy light design is just 80 micrometres thick, measures 15.32 m in length and is 1.87 m high. In 2010, the Airberlin Christmas aircraft appeared for the first time in digital form on airberlin.com. In response to requests from numerous guests, the first actual airberlin aircraft in Christmas livery took to the skies in November 2011. airberlin is the first German airline to have a Christmas aircraft. This entry was posted in Airberlin and tagged 37782, 737, 737-800, 737-86J, Airberlin, Boeing, Boeing 737, Boeing 737-800, D-ABMS, DUS, Dusseldorf, Merry Christmas on November 19, 2013 by Bruce Drum. Jat Airways (Belgrade) yesterday (October 19) celebrated the arrival at its Belgrade base of the first Airbus A319 painted in the new Air Serbia (Belgrade) livery. The first Airbus A319 to arrive in Belgrade was welcomed by the airline’s CEO Dane Kondic with a traditional water cannon salute according to the Serbian carrier on Facebook. Etihad Airways (Abu Dhabi) is acquiring a 49 percent share in the Serbian flag carrier. Jat Airways will be renamed Air Serbia later this year. Copyright Photo: Karl Cornil/AirlinersGallery.com. Airbus A319-131 YU-APC (msn 2621) is now full painted in the new colors of Air Serbia. 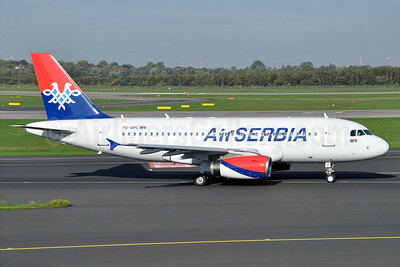 This entry was posted in Air Serbia, Jat Airways and tagged 2621, A319, A319100, A319131, Air Serbia, Airbus, Airbus A319, Airbus A319100, Belgrade, DUS, Dusseldorf, Jat Airways, YUAPC on October 20, 2013 by Bruce Drum. 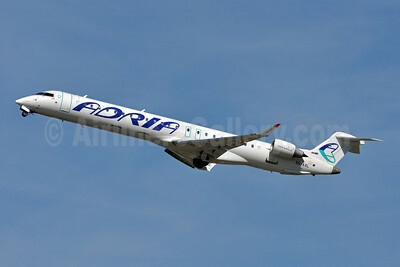 Adria Airways (Ljubljana) will establish a new base at Verona, Italy in time for the summer 2014 season. It will initially operate from Verona to Brussels, Vienna and Zurich feeding the Lufthansa Group of carriers. Adria is already basing a Bombardier CRJ900 in Pristina and operating flights to Frankfurt, Munich and its Ljubljana base. The flag carrier has announced it will inaugurate nonstop flights from Tirana to Frankfurt on April 2, 2014 with four flights per week. In the summer of 2014, Adria will also be expanding its flights from Ljubljana to Prague and Warsaw according to this report by Balkans.com. Copyright Photo: Tony Storck/AirlinersGallery.com. Adria Airways’ Bombardier CRJ900 (CL-600-2D24) S5-AAL (msn 15129) climbs away from Dusseldorf. This entry was posted in Adria Airways and tagged 15129, Adria Airways, Bombardier, Bombardier CL6002D24, Bombardier CRJ900, CL6002D24, CRJ900, DUS, Dusseldorf, Italy, Ljubljana, Lufthansa Group, S5AAL, Verona on October 9, 2013 by Bruce Drum.